MOOSE, WY — Come take a walk on the virtual wild side and explore one of the most popular hikes available at Grand Teton National Park. A new web-based, interactive program takes viewers on an ‘eHike’ around String Lake, one of the six glacial lakes that grace the foot of the Teton Range. Grand Teton National Park interpretive rangers invite classroom students as well as visitors far and wide to explore, through the convenience of their personal computers, the beauty and wonders of the String Lake area. Whether viewers want to relive a previous hike taken around String Lake or plan for an actual visit, this virtual field trip—or eHike—provides an introduction to the features that make up String Lake and its mix of natural habitats. The web-based tour introduces viewers to the various elements—earth, wind, water and fire— that form the physical environment of the String Lake area. It also explains the role these forces have played in the creation of today’s landscape. eHikers can control images and sounds at each stop along their virtual tour, and they can activate videos to further explore the human and natural history stories related to each location. Alternate views will appear by hovering a mouse over side images, and hidden images will be revealed through the click of a button. eHikers can also click on audio icons to hear the sounds of birds and mammals along the trail, use video buttons to imagine being there, and “mouse over” a main image to find hidden gems in the virtual landscape. 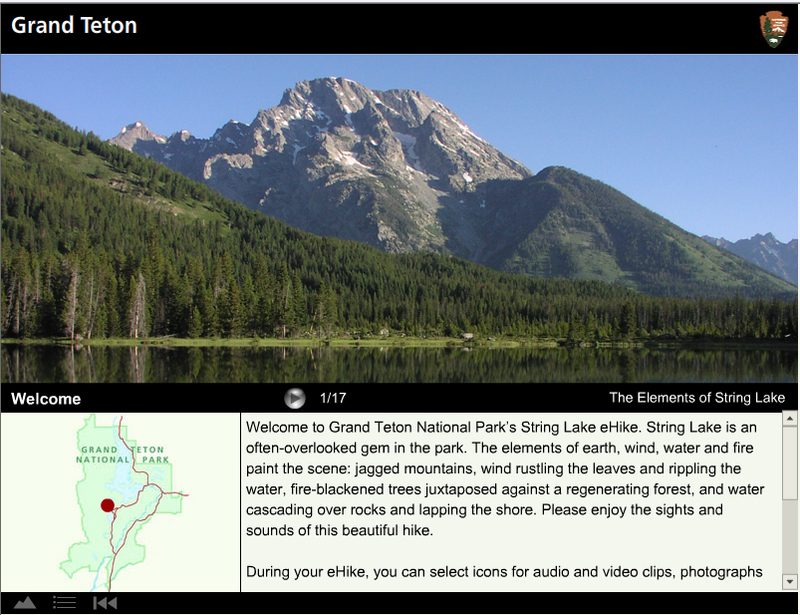 “The String Lake eHike is the first of what we hope to be a series of web-based, interactive programs that help orient visitors to Grand Teton National Park,” added Mates. To experience this innovative program, visit the park’s website at www.nps.gov/grte and click on links for photos and multimedia and virtual tour. MOOSE, WY – To celebrate the arrival of spring, park ranger naturalists will lead early-morning tours to observe strutting sage grouse as they perform their annual courtship dance on an historic lek (mating arena) located just off the Antelope Flats Road near Mormon Row. Strutting grouse trips will be offered on the following weekends: April 13–14, April 20–21, and April 27–28, 2012. Ranger-led excursions offer an exceptional opportunity to witness this unique springtime ritual as sage grouse congregate and perform animated courtship displays. While participants view the antics of strutting grouse, rangers will provide information about their natural history and various conservation efforts underway for sage grouse populations that have declined throughout much of the American West. MOOSE, WY — Did you know April 20-28 is National Park Week? Come celebrate the annual observance in Grand Teton National Park. Join us for special events and programs that are fun and free for the whole family. This is also a perfect time to plan a special getaway to experience the wonders of Grand Teton National Park while we offer free park admission April 22-26. The week kicks off with a celebration of National Junior Ranger Day on Saturday, April 20. Free events will take place at the Craig Thomas Discovery and Visitor Center in Moose and junior rangers who participate in at least three of the activities will earn a Junior Ranger badge or patch. From 11 a.m. to 2 p.m. on April 20, families can explore vehicles and equipment used in park operations including fire engines, ranger cars and snowplows. Visitors are also invited to compete in physical games testing their skills in a ranger obstacle course and against the abilities of various wildlife in the animal Olympics. Come listen to tales about Grand Teton in the story corner, touch and learn about animal furs, feathers and bones or dress up in a real ranger uniform. Staff from the Teton Raptor Center will also be on hand with live birds of prey, and at 1 p.m. there will be a living history demonstration on mountain me. These events are made possible with funding by the park’s long-time partner Grand Teton Association (GTA). GTA will offer junior rangers a 15 percent discount in the bookstore where you can buy numerous educational and exciting books and interesting merchandise like videos, posers, and plush animals using the special discount. 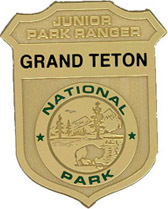 Thanks to a generous donation from the Grand Teton National Park Foundation, free shuttles will be available to transport families from Jackson to the CTDVC for Junior Ranger Day events. Meet at Miller Park at 10:15, 11:15, or 12:15 for the free shuttle. Return trips to town will depart from the visitor center every hour. Space on the shuttles will be limited and available on a first-come, first-served basis. For more information call the CTDVC at 307-739-3399. MOOSE, WY — Grand Teton National Park road crews are nearing completion of annual spring plowing operations on the Teton Park Road from the Taggart Lake parking area to Signal Mountain Lodge. The road opens to non-motorized activities Friday, April 5, 2013. Grand Teton National Park delayed plowing operations by two weeks. That delay, coupled with a relatively low snowpack, allowed plow crews to clear the road in only three days. Spring opening of the Teton Park Road is a process that can take upwards of 10 days to complete, depending on the depth and consistency of the snowpack. Although the Teton Park Road will open to non-motorized use, visitors should be alert for park vehicles that may occasionally travel the road for administrative purposes. The Teton Park Road will open to vehicle traffic on Wednesday, May 1. Visitors are reminded that dogs are permitted on the Teton Park Road. Owners are required to keep pets on a leash no longer than six feet in length, and are required to use waste disposal bags to pick up after their dogs. Mutt Mitt stations are in place at the Taggart Lake parking area. Sage grouse tours begin from the Craig Thomas Discovery and Visitor Center at 5:30 a.m. and reservations are required. To make a reservation and obtain information about what to wear and bring along on these free ranger-led trips, call 307.739.3399. Strutting grouse tours are just one of many opportunities to enjoy Grand Teton National Park during the month of April. This entry was posted in Most Recent, News From The Parks and tagged Grand Teton National Park, www.wyolifestyle.com, Wyoming Lifestyle Magazine. Bookmark the permalink.